This short trip has some unusual attractions. Visit hobo graves, see the Franconia railroad graveyard and loop around an abandoned kaolin mine. 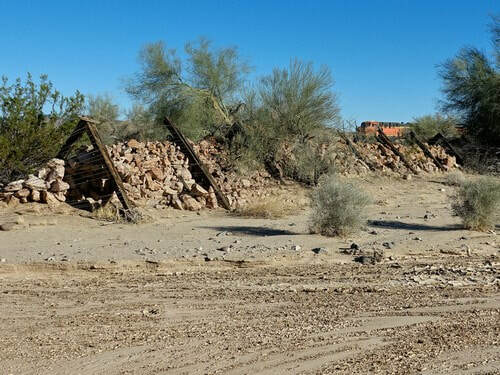 Franconia, Arizona is a derelict railroad siding stop, formerly the site of a section house for the Santa Fe Railroad. Hobos camped on the south side of the tracks and the siding was on the north side. 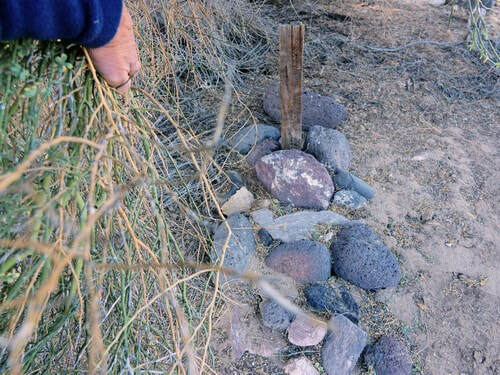 Follow the track along the south side of the tracks and stop at the waypoint for Hobo graves. 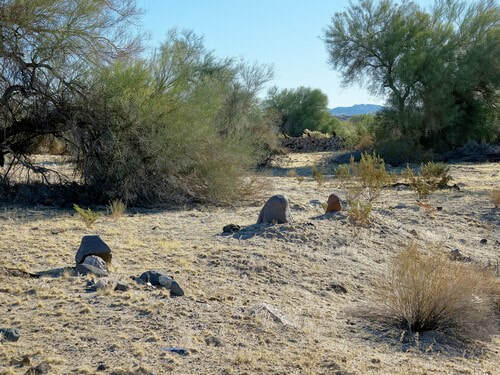 The ​Arizona Pioneer & Cemetery Research Project (APCRP) has a nice article about the history of the siding, two train wrecks in the area and their exploration of graves at Franconia Siding. 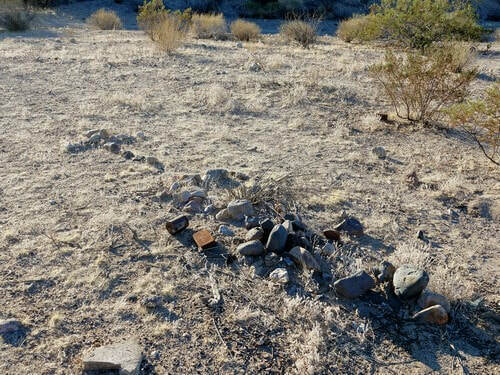 ​APCRP found 8 possible human graves south of the tracks and 2 pet graves. We did not find that many. Both of these graves are hidden by branches so you may need to hunt a bit. We decided not to cut the branches as it might invite vandalism. 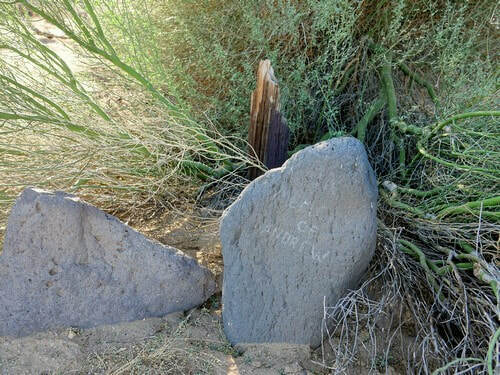 These could be 3 headstones for Hobo graves. There is a water diversion structure to stop the wash from overflowing the area. Continue along the south side of the tracks, cross over to the north side and view the site of the old siding. ​There is a concrete slab that was likely the station house. 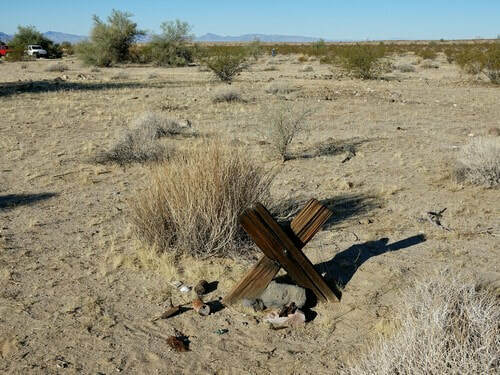 APCRP believed there were 6 human graves in the Franconia Cemetery, east of the slab. Again, we did not find that many. 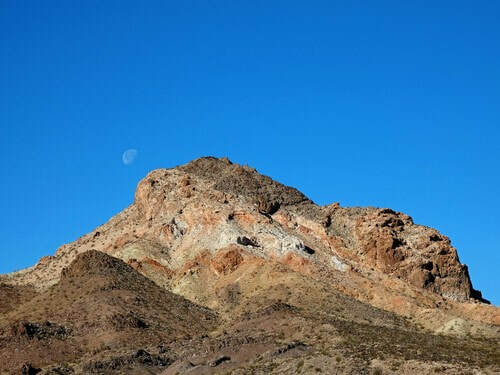 Head north and watch for an interesting hill with multi-colored rocks. 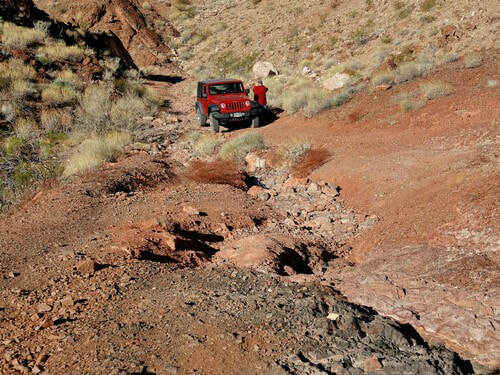 Turn left and drive to a small mine at the base of the hill. 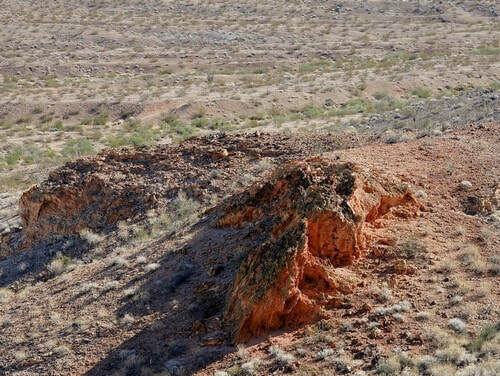 A brightly colored formation is visible as you return from the mine. Turn right and climb up to the Klaner and Doolin Pits. The road to the pits has a washout. Doing the loop counterclockwise requires you climb the obstacle shown. This is on the far right of the opening photo. 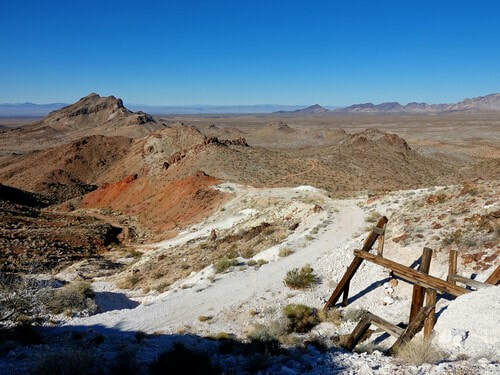 ​You can do the loop clockwise, stop at the top of the hill above the obstacle, and only miss a few hundred feet of the trail. Of course, you also miss the fun. 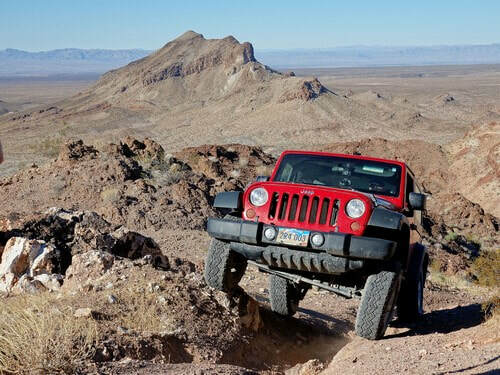 The loop will take you through several mining areas and give you great views in all directions. 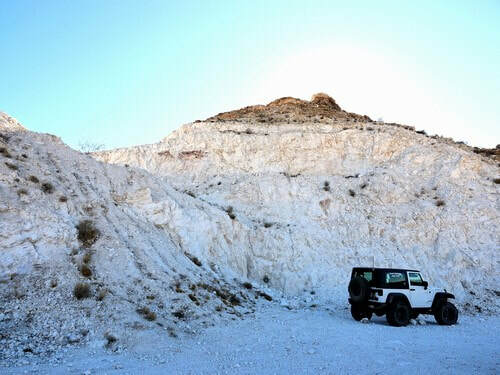 Approximately 40 percent of the kaolin produced is used in the filling and coating of paper. In filling, the kaolin is mixed with the cellulose fibre and forms an integral part of the paper sheet to give it body, colour, opacity, and printability. 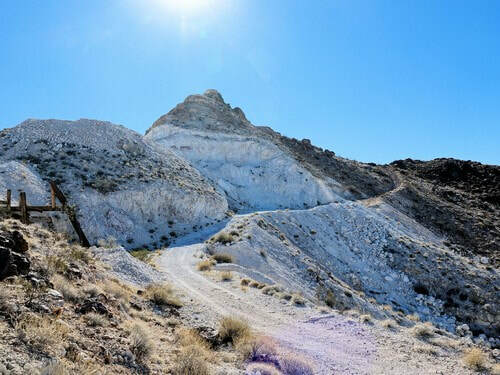 Kaolin is used extensively in the ceramic industry, where its high fusion temperature and white burning characteristics makes it particularly suitable for the manufacture of whiteware (china), porcelain, and refractories. 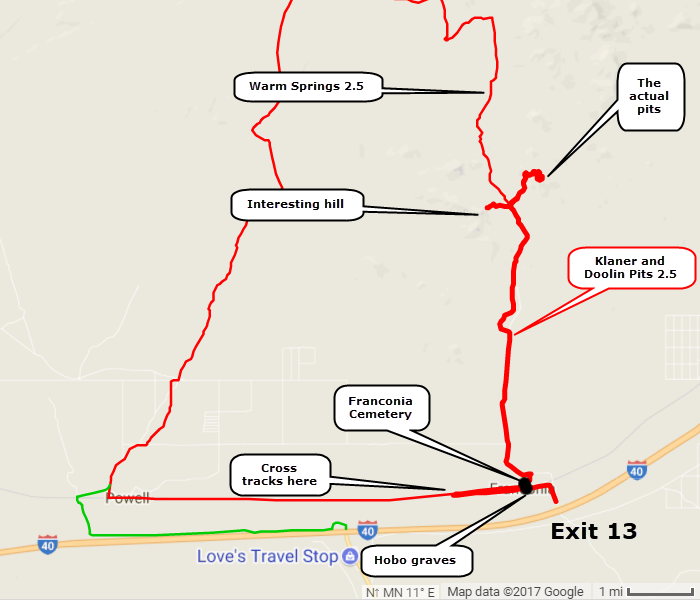 Return to the bottom of the hill and either return to I-40 the way you came in or go north and do Warm Springs 2.5. We do not like the Warm Spring loop but many people do.